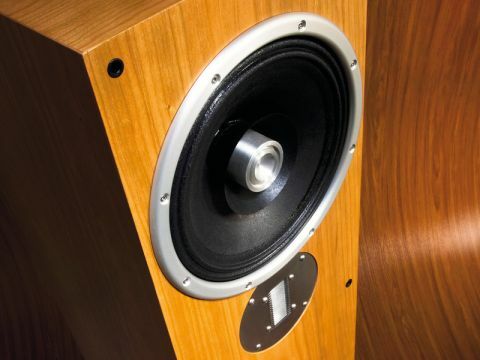 In a hi-fi world largely populated by loudspeakers that stick pretty close to the marketplace stereotype, it's always interesting and challenging to come across something that is very different and which quite deliberately flouts normal loudspeaker design conventions, such as these Zu Essence loudspeaker. Founded in Utah around the beginning of the century, Zu Audio is a young company with a radical – one could even say iconoclastic – attitude to hi-fi sound reproduction. Its main activity is concerned with loudspeakers, but it also has a comprehensive collection of cables and a handful of other bits and pieces, including modified versions. Zu's principals reckon things have gone wrong with hi-fi today; that it has become "clinical and dead" and "unmoored from its pioneering past and the music and physics that had set it off". Zu is by no means alone in questioning whether hi-fi has lost its way as components have become more complex with the passage of time and in proselytising a return to simplicity. A whole subculture is devoted to revived and restored historic hi-fi, including idler-wheel drive turntables, single-ended and push-pull valve amplifiers and speakers with solitary 'full-range' drive units. Zu's £3,750 Essence doesn't quite fit into the latter category, but it gets pretty close and the combination of an easy load with high(ish) sensitivity means it's well suited to driving valve amplifiers with limited power outputs. The main driver in this case is that rare beast, a dual-cone 10-incher – 250mm in modern parlance, though few have been around since our masters instructed us to go decimal. The need to position such a large driver so that its centre is roughly at seated-ear height means that the essence is both taller and wider than is currently fashionable. indeed, some might describe this speaker as a bit of a throwback stylistically speaking and the situation wasn't helped by the rather anonymous dull brown veneer that dressed our samples. Happily, there are many much prettier options available, including (at a £500 premium) high gloss any-colour-you-like and even (to special order) any custom finish you care to specify. The essence is effectively the successor to Zu's Druid IV, but although the two models look somewhat similar, the measured differences between them are, in fact, surprisingly large. The two enclosures look much the same from the front, though the essence has a much deeper – roughly square in plan – enclosure and a different (and much more satisfactory) plinth treatment. The essence also has a ribbon, rather than a horn tweeter and its 250mm main driver now has a large cylindrical central polepiece extension. This is actually a 'one-and-a-half-way' design, as no attempt is made to roll off the upper end of the main driver. Its large 195mm paper cone, terminated in a double-S doped fabric surround, will naturally have restricted and very directional high frequencies, but the smaller 95mm 'wizzer' cone should help extend things a little. Ultimately, however, the relatively large diameter (50mm) voice coil will have a relatively high inductance and this will introduce its own natural first-order rolloff (while also conferring generous power handling). It's logical, therefore, to add a tweeter to extend the top end and Zu has gone for a powerful ribbon device, roughly 60x 5mm, transformer-coupled to its crossover and mounted little below seatedear level. The bass is loaded by a 'slot' port created by spacers between two identical plinths, providing what the measurements suggest is some species of reflex-loading. however, Zu attributes the actual loading system to the motorcycle exhaust tuning technique of one Ron Griewe, based on 'alternating velocity theories'. That's as may be, but the plinth does marginally (and very necessarily) extend the stability footprint and ensure secure accommodation for the US-type spikes. Electrical input is provided by a solitary flexible cardas terminal clamp, which is good for spades and bare wires, but less than ideal (though still useable) with 4mm plugs. Unlike its Druid IV predecessor, the larger essence is best positioned well clear of walls. And in order to get the most presence output, the speakers should be directed towards the most favoured listening seat. The essence delivers an exceptionally well focused soundstage with unusual lateral image precision, which is probably due to a combination of factors. On the one hand its unusual phase accuracy helps remind one that the Greek root 'stereo' actually means 'solid'. At the same time focus will be enhanced because other elements of the design tend to favour the direct sound over the room-reflected sound – partly because its upper-mid off-axis output is likely to be somewhat restricted, but also because the tweeter is set low and essentially operates as a line source with limited vertical radiation. The counterpoint is that the impression of air and space is rather restricted here. The essence defines the soundstage rather impressively and precisely, but it doesn't involve the listening room as much as some other wide-dispersion designs. This isn't any sort of criticism; rather it's an observation of where the essence sits on a spectrum between directional (eg panel dipoles) and omnidirectional. The most obvious source of criticism here concerns the balance anomalies. These are not severe enough to undermine the essence's very real strengths, but they do tend to define the overall character of the speaker and introduce a degree of associated coloration. The most serious is probably some lack of energy alongside significant unevenness in the presence and lower treble. This has the advantage of helping avoid the speaker sounding aggressive when the volume is turned up high, but it also tends to reduce the impression of openness, somewhat softens the impact of transients such as hard-edged consonants, yet at the same time a touch of 'edginess' occasionally asserts itself. The bass could have been smoother, too under our room conditions, at least. There's no lack thereof, which is itself creditable in such a high-efficiency design, but it does have a tendency to thump a bit and seems a little lacking in warmth and texture. The essence might fall somewhat short of perfection in balance terms, but the ace up its sleeve is that it simply sounds more 'real' than the overwhelming majority of alternatives. It has a solidity and believability, a vividness of expression and, above all, a splendid coherence and freedom from timesmear that some listeners will find quite irresistible. Some will certainly fall under its spell, though one suspects that others may find its limitations a little too obvious. In a very real sense it has some (admittedly rather tenuous) links to the unique sort of sound character that Rehdeko speakers demonstrate. The essence's combination of a decent size diaphragm, good sensitivity and the freedom from timesmear brings considerable dynamic expressiveness to the proceedings. Unlike the Rehdekos, however, the essence does make some concessions to considerations of balance and bandwidth. The sound is not all that smooth – indeed the overall impression of the sound is that it is a little coarse and uneven – but it does, at least, cover the full audio band, and the tweeter sounds well-integrated.